To paraphrase the famous Shaker song, simplicity is a virtue. I’ll add my voice to that song any day when it comes to photography. What I mean by that is what I often refer to as ‘essence.’ I’ve addressed this issue recently in a blog. I’d like to take that a step further in this blog. When we are out in the field and observe a landscape that we want to photograph, we are often swamped by the sheer detail in the scene. Landscapes, after all, are typically complex scenes. There are trees, rocks, clouds, mountains and water, often in the same scene! How do we convey a story, the story we want to tell, in such a jumble of concepts? I often urge my students to think in terms of what is the story that you are trying to tell? Can you reduce it to a single concept? If so, how can you manipulate the scene to emphasize that story line? Can you crop out the extraneous, distracting elements? Can you move the focal point to better tell the story or emphasize one detail over another? Going one step further is the long-revered concept in photography known as minimalism. How can you tell that very same story by reducing the elements in your photo to the very basics. 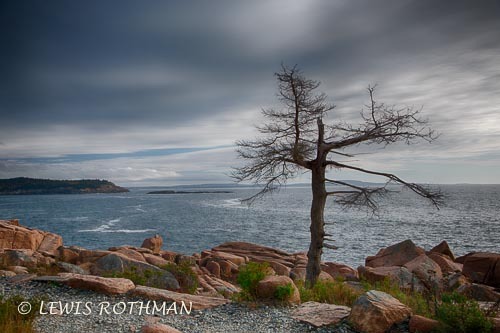 And here is where I’d like to introduce you to one of the photographers who recently took my Acadia National Park workshop. In my opinion, the lightbulb came on when Lew felt that the shot rendered better in B&W. I fully agree with his decision, and I think that is true because of the ‘essence’ and minimalism concepts. Here we have the four basic elements of nature: sky, water, tree and earth. Lew was able to focus the reader’s attention on that and that alone. It is what I might call elemental. That minimalism helps the image. I think that the way he placed the tree using the Rule of Thirds helps, as does the way he rendered the clouds. 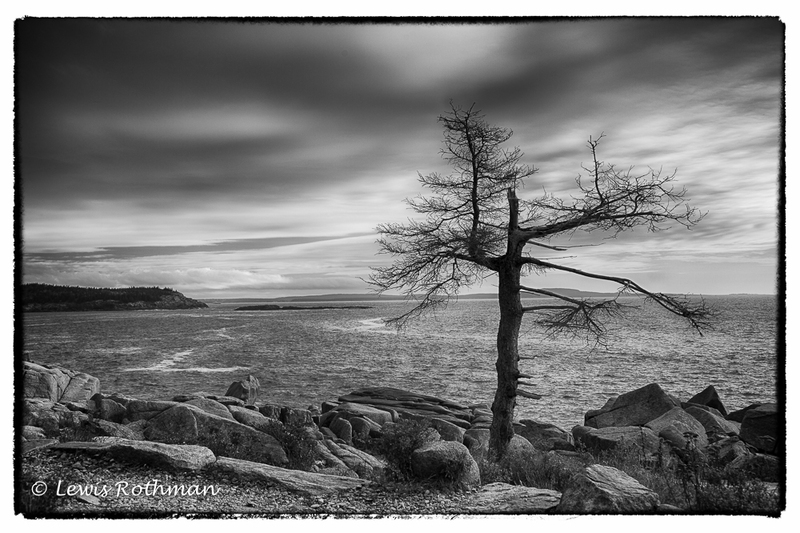 Despite unfavorable weather conditions, Lew was able to extract a wonderful image from the outing. His use of HDR is restrained, which I feel also helps make the image. Thanks to Lew for allowing me to share his work with my readers.